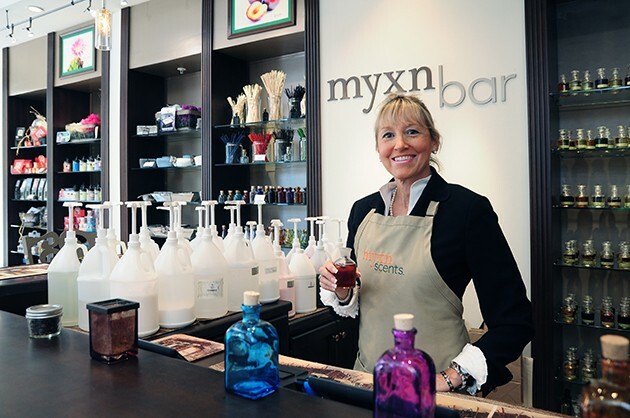 As one of the most unique stores of its kind in the area, Myxn Scents is a totally new retail experience with a distinct apothecary feel that is dedicated to the creation of customized scented body and home products. Guests select their own individual fragrances by choosing from 500 scents. The next step is a visit to the Myxn bar for a social mixing event or the more private Myxn tables with a carousel containing 353 scents. After creating your own custom product, you will be rewarded with a strong sense of personal accomplishment. The atmosphere here is fun, friendly, and entertaining. Myxn Scents offers a variety of lotions, bath and shower products, scented shaving options, spritz, cologne, nourishment oils, massage products, exfoliation scrubs and even pet shampoo. Home care products can be created to freshen vacuum cleaner bags, tennis shoes and small, enclosed environments such as a car, camper or boat. Many guests create multiple signature scents for a variety of products. Much like personalities, each person’s sense of scents can be totally unique. If you are seeking a place to celebrate a special birthday, milestone event or a unique area “attraction” for visiting guests, bridal parties or an afternoon out with the girls, just give us a jingle. 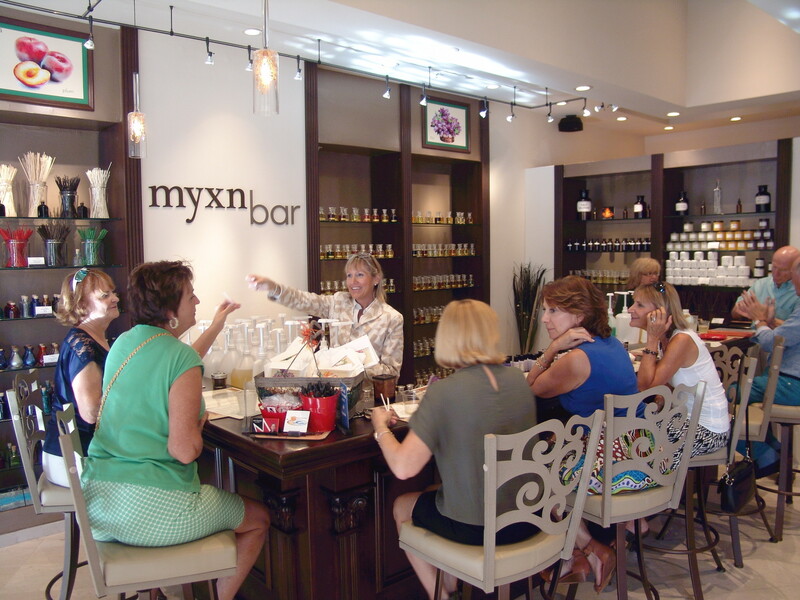 Myxn Scents will add to the festivities by providing wine and cheese as well as hors d'oeuvres as your friends “mix away” or shop from the wide selection of unique products such as crackling wick candles, cut soaps from a loaf, and high-end fragrance brands. Myxn Scents tracks your special formula, enabling you to create other products in your own customized scent, in person or via their website. The entire interactive experience is fun, easy to do and a genuine aromatic odyssey and true shopping experience … for both men and women. Call us to book your special gathering or for more information.